From the Department of Neurology (A.V., A.C., S.M. ), Division of Pediatric Neurology, and Department of Pediatrics (C.M.T. ), Rutgers New Jersey Medical School, Newark. Leigh syndrome is clinically and genetically heterogeneous, associated with mutations in mitochondrial and nuclear genes.1 Diagnostic criteria include progressive disorder with motor and intellectual delay/regression; signs and symptoms of brainstem and/or basal ganglia disease; raised lactate concentration in blood and/or CSF; and one or more of the following: (1) characteristic features on neuroimaging (bilateral symmetrical hyperintensities in brainstem, basal ganglia, dentate nuclei, and optic nerves on T2-weighted MRI); (2) typical neuropathologic changes; and (3) typical neuropathology in a similarly affected sibling.2 We describe 2 African American siblings who have a mutation in the mitochondrial MT-TL2 gene and a clinical diagnosis of Leigh syndrome. The same mutation is also identified in their neurologically asymptomatic mother. The brother who failed to progress on motor milestones since age 1 year presented with 4 months of progressive ataxia and weakness at 2 years of age. He was not able to pull to stand or walk without support. Growth parameters were below the third percentile. Examination revealed bilateral ptosis, left facial weakness, global hypotonia, mild weakness in all extremities, and severe truncal and limb ataxia. Serum and CSF lactate levels were 2.8 mmol/L (0.5–2.2) and 2.6 mmol/L (0.5–2.2), respectively. Brain MRI revealed T2 hyperintensities involving bilateral putamen, red nuclei, substantia nigra, thalami, and periaqueductal gray matter (figure). Mitochondrial DNA sequencing revealed a homoplasmic m.12311 T>C change on MT-TL2 encoding tRNA Leu (CUN). Two months later, he required mechanical ventilation during sleep and subsequently died at the age of 3.5 years. His younger sister presented at 3 years of age with a 1-year history of motor regression, speech delay, and ataxia. She lost her ability to walk or stand unassisted, exhibiting truncal and limb ataxia, but was able to crawl and sit with support. She had limited 2-word phrases. Growth parameters were below the ninth percentile. Serum lactate level was 1.72 mmol/L (0.25–1.1). T2 hyperintensities were seen in bilateral substantia nigra, thalami, and brainstem. She remains neurologically stable at the age of 4 years. 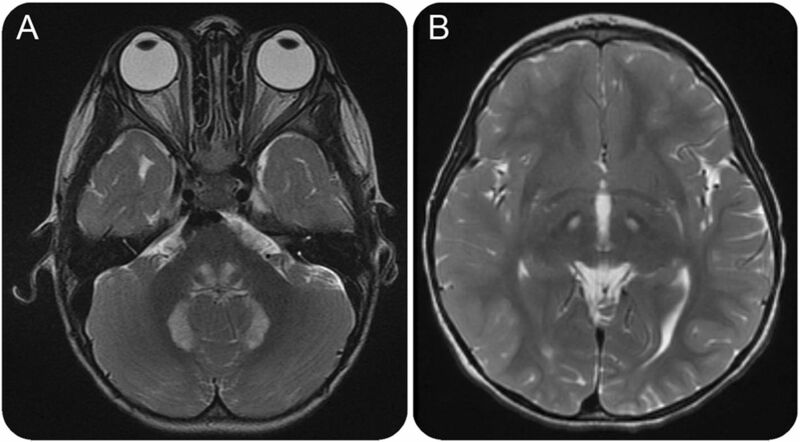 Axial T2 image showing hyperintense lesions involving periaqueductal gray matter and cerebellar hemispheres in our first patient (A) and in thalami in his sibling (B). Association of this T-to-C substitution at nucleotide 12311 on MT-TL2 with Leigh syndrome has not been clearly described. This mutation was previously described in a patient with chronic progressive external ophthalmoplegia.3 In addition, heteroplasmic MT-TL2 mutations have been reported in patients with mitochondrial encephalomyopathy and myopathy.4 Affected site in our patients is conserved among species during evolution,5,6 and the gene itself is one of the most conserved mitochondrial tRNA genes among closely related species of hominoids.7 Mutations in mitochondrial tRNA genes were reported in Leigh syndrome.1 We speculate that this mutation in the highly conserved region is associated with Leigh syndrome phenotypes in our patients. This is supported by the presence of the same MT-TL2 mutation in their mother with bipolar disorder, indicating that this change may have variable penetrance or heterogeneous expressivity commonly seen with other mitochondrial disorders. We suggest that patients with clinical criteria of Leigh syndrome be screened for this mutation to confirm such an association. Author contributions: Aravindhan Veerapandiyan: study concept, drafting, and revising the manuscript. Amit Chaudhari: drafting the manuscript. Christin M. Traba: revising the manuscript. Xue Ming: study concept and revising the manuscript. Disclosure: Dr. Veerapandiyan, Dr. Chaudhari, and Dr. Traba report no disclosures. Dr. Ming has served on the editorial boards of the Journal of Pediatric Neurology and the Journal of Sleep Disorders and Therapy; and holds a patent for Polyunsaturated fatty acids interactions and oxidative stress disorders. Go to Neurology.org/ng for full disclosure forms. The Article Processing Charge was paid by the authors. Accepted in final form July 13, 2016. Leigh syndrome: clinical features and biochemical and DNA abnormalities. Ann Neurol 1996;39:343–351.
. Point mutations in mitochondrial tRNA genes: sequence analysis of chronic progressive external ophthalmoplegia (CPEO). J Neurol Sci 1994;125:50–55.
. Online Mendelian Inheritance in Man (OMIM). Baltimore: Johns Hopkins University; 2001. Sequence and organization of the human mitochondrial genome. Nature 1981;290:457–465.
. Sequence and gene organization of mouse mitochondrial DNA. Cell 1981;26:167–180.
. Evolution of hominoid mitochondrial DNA with special reference to the silent substitution rate over the genome. J Mol Evol 1993;36:517–531.